I love vintage fashion, so I look to my vintage knitting magazines and history of costume books when I need inspiration for a new design. I work in the fashion industry for my 'day job', so I end up reading a lot of fashion magazines and keeping up with current trends. Sometimes I see new trends that are really great to be translated into hand knits. I am also inspired by the unusual knitting techniques, like entrelac and mosaic knitting. There aren't tons of patterns that employ these techniques so I am inspired to create a pattern so that other people will want to learn these techniques too. I think it is a tie between entrelac and cables. Entrelac is so addicting, all those little rectangles that look so strange while being knit. I love creating my own cable patterns, so far they all seem to involve hearts. I think I enjoy creating the cable charts as much as I enjoy knitting the cables. Knitters come in all different sizes, so I try to create a range from 30" to 54" bust. Yes, I love to see what other designers create. There is so much I haven't learned yet, I like to see creative new ideas and hopefully come up with some of my own. I don't think patterns should have to be dumbed down at all. I usually ignore the difficulty rating of a pattern, if I am really determined I will be able to figure it out. I don't think knitters should be too intimidated by a complicated looking pattern. If we didn't dare to step out of the box, it would be hard to become a better knitter. I do all the sample knitting. 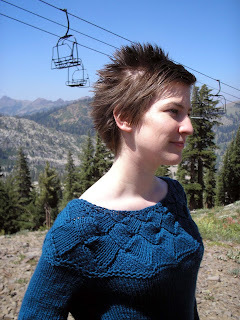 On Ravelry, I usually ask a few knitters to test knit my patterns if I am self-publishing them. Do you have a mentor? Not really. I learned to knit on my own from a knitting kit my mother gave me, and currently I usually do all my knitting by myself. I am inspired by Elizabeth Zimmermann, I think her style of knitting patterns that challenge knitters to think for themselves are really great. Almost all of my business is conducted through the Internet, so it is of course very important to me. I only sell my self-published patterns online and have had patterns featured in the online knitting magazines Knotions and Popknits. The Internet has brought a way for knitters all around the world to connect, and I think it has really changed the way knitters interact. Sometimes I get receipts for my knitting patterns and find that the purchaser is from the UK or some country far from me, and it just thrills me to think that my pattern has made it halfway around the world. It is hard, I usually end up knitting in favor of other household duties that should really be done first. It can be difficult to grow a thick skin, because after such hard work you would hope that the pattern is a crowd pleaser. But everyone has different tastes, so there will never be one pattern that everyone loves. Designing knitting patterns is still a very part time job for me, but I love it wouldn't want to give it up any time soon. I hope in the future to make it my full time job. If you are passionate about knitting and designing, then just knit as much as you can and read as many knitting books as you can. There is so much out there to learn. Also write down all your ideas and sketches. Eventually some of those doodles will evolve into a great pattern.